I pretty much never go to Sam's anymore but I ran in the other day to check out some prices and I happened to stumble upon a HUGE bag of Cracker Jacks. Like double the size of a family sized bag of potato chips huge. I kid you not. Cracker Jacks are one of those things that I kinda forget exist when they are not in my direct line of vision. I have never said to myself, "Man, I wish I had some Cracker Jacks right now." But every time I see/have/hear about them, I remember how good they really are. Proof: I brought this 20 cup bag of Cracker Jacks and I am pretty sure that between Justin and I we ate about 10 cups of it in 3 days. 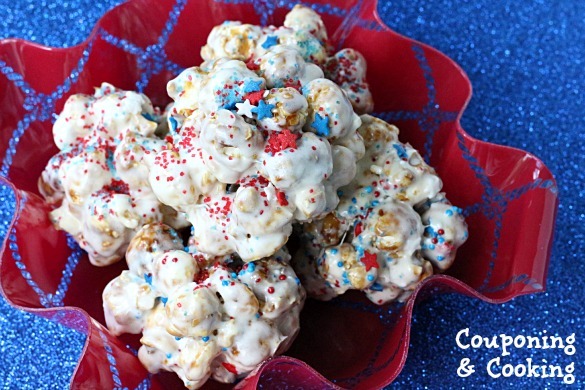 So I decided I had to make something using Cracker Jacks if for no other reason than to keep Justin from over dosing on popcorn/fiber. 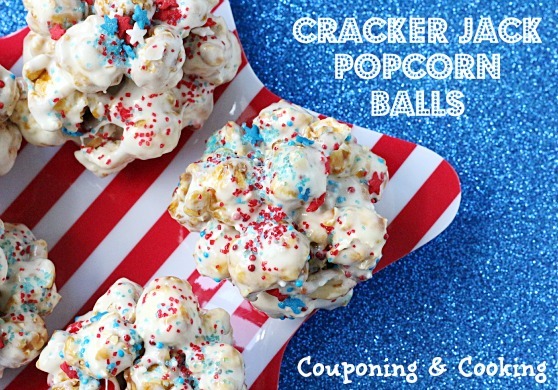 And with the 4th of July coming up, what could be more American than Cracker Jacks? And what do you think of when you think of Cracker Jacks? Baseball. 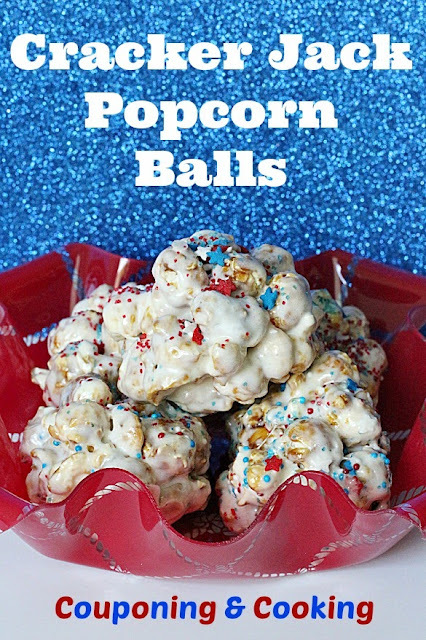 So I made Cracker Jack Popcorn Balls because baseballs are round, and white. You get where I am going right? Don't let this strange combo freak you out. There is something magical about the intensely sweet, marshmallowy coating covering the slightly sweet, slightly crunch, molassesy Cracker Jacks. Enough adjectives for you? It better be. You know what makes these even better than they already are? There are only three ingredients (unless you count sprinkles as an ingredient which I don't) and you don't even have to turn your oven on. 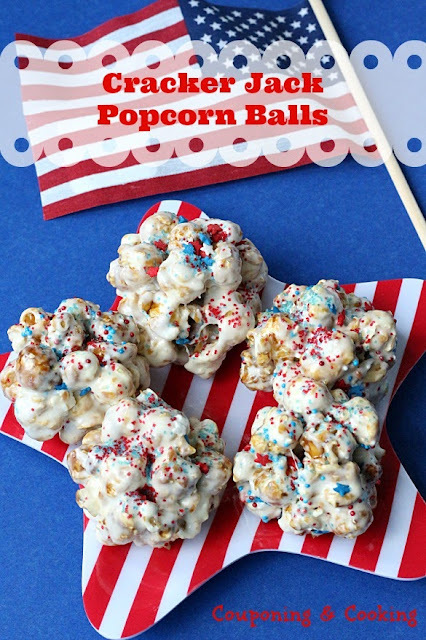 So run out to your nearest bulk warehouse retailer and buy this massive bag of Americana so you can make these too! 1.) In a large bowl, microwave the butter until melted. 2.) Add the marshmallows to the same bowl and microwave for one minute. Stir and then return to the microwave for another minute. 3.) 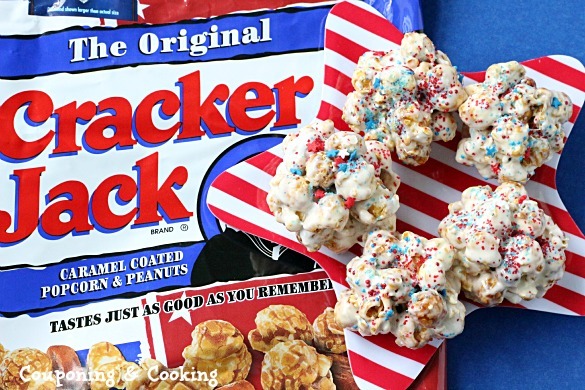 Stir again to mix marshmallows and butter together completely and then slowly stir in the Cracker Jacks. 4.) Mix until the Cracker Jacks are completely covered in the marshmallow mixture. Let cool until you can handle the mixture. 5.) Lightly coat clean hands with cooking spray and then shape the mixture into balls. Make sure to pack them together tightly so that they stay together as they cool. 6.) You can wrap them individually in plastic wrap or store them in an airtight container. They are best when eaten within 48 hours.